My Yatra Diary... Goes Melbourne! “The chance which seems lost may present itself at the last moment"
From where should I start this piece? It’s difficult to catch a reference point for some articles, some days. Hmm... let me try. It’s been one whole entire year to get to where I am now. 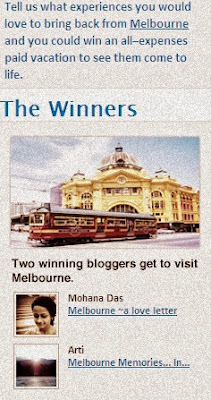 Since winning the coveted all expenses paid vacation trip to Melbourne hosted by IndiBlogger and Tourism Victoria on 18th October last year to actually going there on the 20th October this year, it’s been quite a journey. Will the trip happen? Should the trip happen? Yes, No, May be? And, guess where all this started from? Long before I actually won the trip, it was your wonderful comments and heartfelt wishes that made sure I already felt like one! What prize can be greater than the feeling of being loved and praised for your humble efforts by everyone? Thanks to all your gracious admiration towards my lame attempts at sketching, you made me humbly believe that I have a talent in sketching and what’s more amusing is that now I keep bragging about it to people. Even though, in reality, all I can only do is scribble and scrawl. Hah! Humbled by your love: Some feelings are priceless! But such is the power of love... when showered in abundance, it makes you believe, believe in things that perhaps do not even exist and above all it makes you believe in your own self. Thank you very much from the bottom of my heart for all the blessings that you bestow upon me. This trip is all your’s. Just like Japan. And my only wish and prayer is that I am able to do proper justice to it by bringing back the true beauty of Melbourne, something that we all will cherish and appreciate – together, long after my return. Talking about this journey wouldn’t be complete without thanking IndiBlogger, an Indian blogger family headed by a bunch of cheerful, quick witted and good-hearted folks who have added all sorts of colors in “My Melbourne Memories... in Monochrome” and have made all the difference. They have been through my thick and thin, my tantrums and wisdom, my sanity and vanity. They have stood up and fought for me when I was all set to quit and say goodbye, they have always been available to answer my calls or go through my lengthy (maybe, even pointless!) e-mails. They are the ones who have taught me lessons, knowingly or unknowingly, and inspired me to be what I am; I owe a lot of myself, as a blogger and also as a person, to them. I feel very blessed to have them in my life, and whether I say it or not, IndiBlogger – I like you, I love you and I am so proud to exist within you. Thank you. I am wobbling in a mixed pool of feelings... that of a childlike delight, a wonder that is laced with an incredible curiosity of a new world, new people, new food, new sights, new sounds – an unknown anxiety, of a once-in-a-lifetime opportunity, of a dream coming true – all stirring up a whirlwind of emotions... all at once - making ME. Today: My VISA is approved, ticket issued, a tight budget set, a rough itinerary prepared and bags almost packed. And, Now: In a couple of hours, with high soaring dreams in its wings and a spring in its steps – My Yatra Diary... is all set to fly off to Melbourne! This is only her second international trip after Japan (till a couple of years back, even a first seemed impossible!) and she can’t be more grateful for all her blessings, for all the grace that has been. Please do wish her luck along with your goodbye, she is incredibly nervous right now, and she really needs them. Tell you something -- Your wishes are magic. She has lived them once already, so she knows. And finally, if you have any suggestions or tips on how to go about sightseeing in Melbourne or what colorful memories you expect me to bring back from Melbourne for all of us to cherish, please do let me know in the comments section. Arti, this is AMAZING! and wonderful! Such a great adventure. And all through blogging! You really deserve it and will make the most of this trip. Can't wait to hear about it and wish you LUCK! I'm waving goodbye to you, Arti! I hope you have another fantastic trip, just like Japan. Keep your heart open as you always do and many blessings and adventures will come to you. Safe trip from your friend in CO.
How exciting this will be! And so different from the other trips. Did you draw this picture? It is very good, you are an artist. Oh huge congratulations Arti - that is wonderful! So happy to hear your news and you are going to love Melbourne. I visited there with a friend many years ago - there are some great shops, and wonderful restaurants. Best wishes Arti! Have loads of fun and comeback with a bagful of stories to share! Hi there - I did not realise your trip to Melbourne was a prize! Have fun! Excellent. Congratulation on winning the prize. You deserve this. Hve a nice time ahead. enjoy and Happy Journey. Hey get some choclettes for all of us. Since I will not be able to take it from you, share all the sweet memories. Such a sweet post Arti.... I wish you loads of luck and Love for your trip. I hope it's as magical as you have imagined it to be! This post of yours has lifted my spirits and has cleared any doubts I had about Indiblogger. Thank you My dear, and have safe and sound journey. 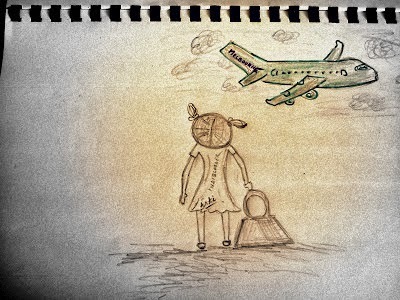 More sketches-lovely .And all the best for this long awaited trip-enjoyyyy. Oh my goodness how amazing. You so deserve every blessing that is bestowed upon you. Great achievement Arti madam, Congo ! Oh wow Arti! That is so exciting! 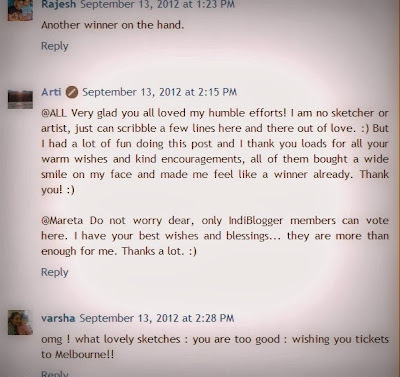 Congrats on winning the competition- no wonder you did:-) I was so moved and so happy for you - when I read your post! I wish you a fantastic Melbourne-adventure, and I am all tuned to read your tales. (Should be some yummy Greek restaurants over there too? :-) All the best dear Arti and ENJOY!! I am so happy for you that you are finally going.Cheers! Congratulations! Enjoy your days at Melbourne! Many Congratulations once again,Arti. Enjoy Melbourne. Your friends in Nara are often remember you! Oh I am late reading this Arti but I am so excited for you and so happy you get to take this wonderful trip; I can't wait to read your posts. Have a wonderful time -- I know you will. Lucky you. .Have a great time! wow, so happy for you Arti, have a safe flight and fun trip! I know you'll bring us lots of wonderful memories. Oh wow! congrats and have a wonderful trip! Melbourne is a super charming city - I have been there! Just now read your image closely. Are you kidding me? It is so awesome that you've won such contest. Really fantastic! Yay!! way to go girl :) enjoy your trip. cheers! Congratulation again! We ,friends in Nara, always cheer for you. I am looking forward to your travel journal. Congratulations! I have NEVER heard of anyone visiting Melbourne (or Australia for that matter) and not returning with thrilling stories of amazing sites and friendly locals. You'll have a blast! Awaiting your series on Australia.. 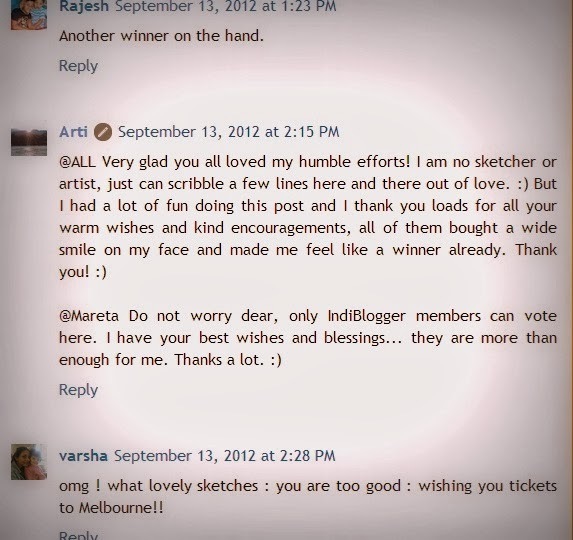 Yes, thank you indiblogger helping traveler to travel more..
Arti, have a nice journey. I'm soooo happy for you, my dear friend! I know you will go places the first time I read your blog. Wow ! From Japan to Melbourne. Where next ? Totally deserving. A Melbourne Halloween And An Indian Diwali!